See previous post. We were hungry and since it is getting to be summer here in SF with the overhead clouds and fog swirling around, we went to New Saigon for some hot noodle soup. We arrived at 11:25 and were alarmed to see that the lights were off and the entry was barricaded by a sturdy storefront grate, but the door was open and we saw one of the old ladies sweeping the floor inside. We decided to wait and had a look at the menu in the window. 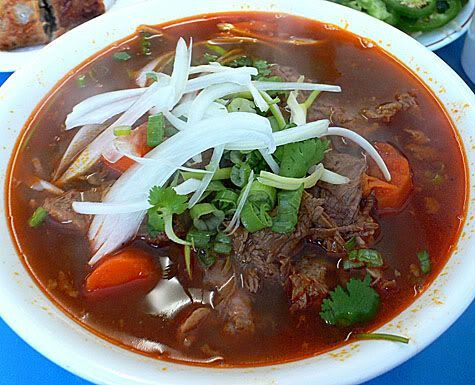 I became fixated on a picture of spicy beef stew that looked really good which ES said he usually orders. Eventually, another woman came scurrying up with bags of vegetables. She unlocked the grating and ushered us in. Once inside, I decided not to look beyond the noodles on the menu and stuck to my plan of ordering the Spicy Beef Stew and an order of Imperial Rolls. 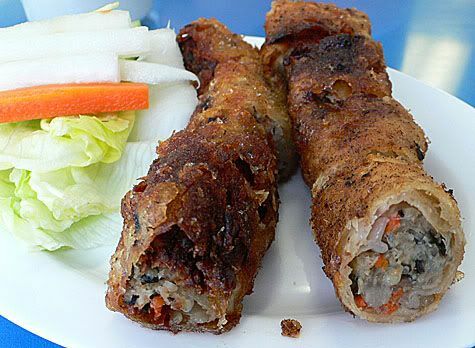 The rolls are very good, although a little tough and blackened on the exterior. I was a little anxious about the level of spicness when the stew arrived because of the brilliant orange hue on the surface of the steaming bowl of soup. It was perfect and delicious, with a lighter consistency than I expected for stew, but bursting with flavor. I threw in a handful of the beansprouts, some fresh basil leaves and a squeeze of lime, which added a lovely fresh taste to the dish. There was body in the mouth feel of the hot, sour and spicy soup. It was steaming and fragrant with the aromas of basil, anise and cinnamon and the chilies caused a slight burning around the perimeter of my mouth. 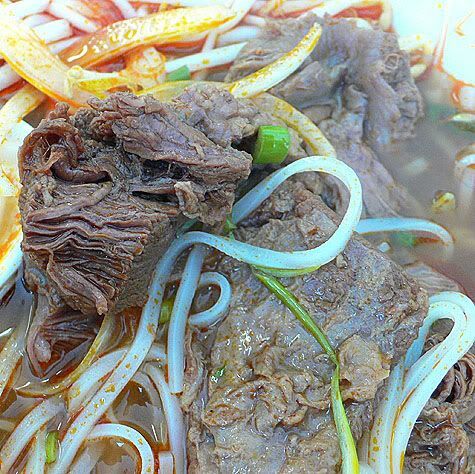 The bowl was full of beautiful stewed meat that basically fell apart in your mouth, along with a generous mound of rice noodles for a very satisfying meal. 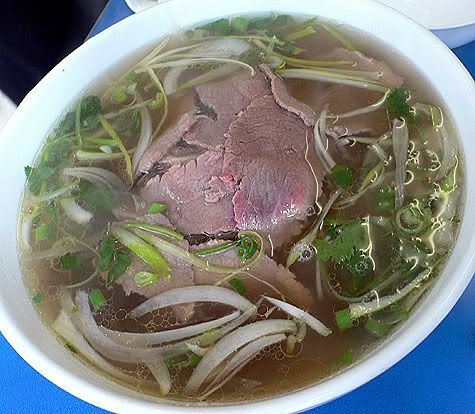 Considering how many times I have been out for pho, I can’t believe that I have never tried this dish before! It is my new favorite. 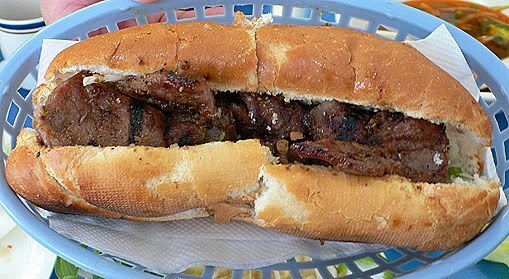 Those two were still hungry after the noodles and split a BBQ Pork Sandwich that illicited exclamations of happiness when they bit into the toasted baguette filled with thick slices of pork. Underneath the piles of pork were slices of onion, cucumber, carrot, pickled daikon and fresh coriander. 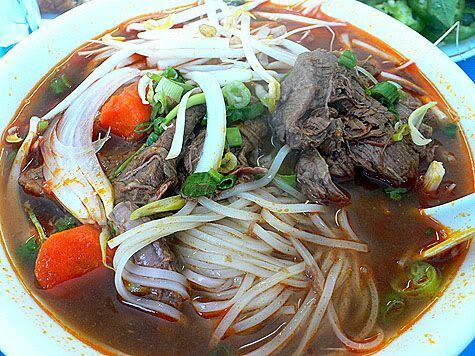 Absolutely, I will be back, especially for that spicy beef stew… and the cambodian noodles are pretty fabulous too. 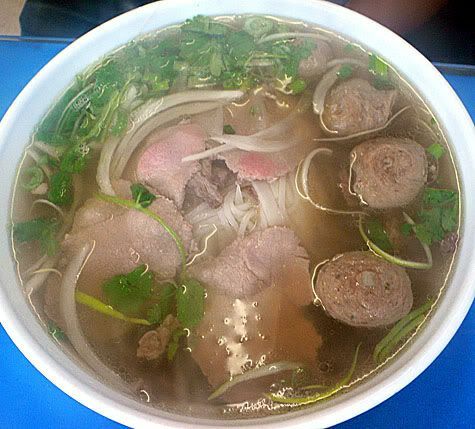 You should really try the Vietnamese bowl or dish called Bun Bo Hue. :] Spicy and nice.